Gerald is a postman, much like many other postmen. 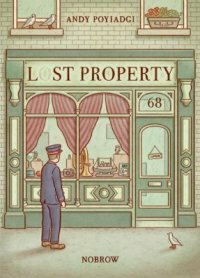 One day, having lost a precious and personal item, he visits his local lost and found. Only to find far more than he bargained for, because in this 'self-storage', each and every one of Gerald's lost possessions has been kept and contained. How each item got there, and why they were, was a mystery - but there they all were. What will he do with all his old belongings? beautifully illustrated submitted by -alex- on August 11, 2016, 11:40am Poyiadgi's book is a little too slim for the format (it takes maybe 5 minutes to read), but it's beautifully illustrated, and very cute. Definitely glad I came across it. Description: 24 unnumbered pages : chiefly colour illustrations ; 23 cm.